The ultimate high-tech and high-powered option for in-office espresso breaks. Eight varieties to choose from and three different types of beverage options: Ristretto, Espresso or Lungo. Choose a capsule and size and your personal cup of coffee will brew in under 60 seconds. Hot water is also provided to produce other hot beverages. Used capsules are automatically deposited into an internal bin to hold them and ensure hands-free clean up for up to 25 cups of coffee. Removable tray allows you to change the size of your mug with ease. 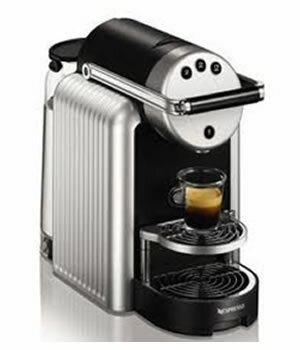 Description: Nespresso is the leader in quality single cup espresso for the office. The sleek Zenius is the ultimate choice for an office that wants the perfect espresso. Attractive and easy to use, this is a great fit for any office that wants to offer coffee house/high end restaurant quality espresso to their employees and/or clients at the touch of a button.